July 4th holiday weekend is upon us and the throngs of humanity are rushing out to celebrate, camp, travel, fish...basically get outdoors and enjoy summer. No better way to celebrate. The weather here has been HOT! typical Chico/Nor Cal heat wave 100-108. 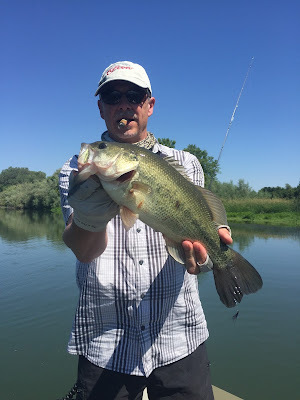 Hot, but if you get on the water early and get off into the A/C by 2-3pm plenty of good fishing to be had and a great way to sweat out the heavy beer, alcohol, or garlic you have been consuming. I have been spending all my time guiding for stripers and things are shaping up to be a great summer of striper fishing on the Lower Sac! Striper fishing on the Lower Sacramento - Fishing has been good. 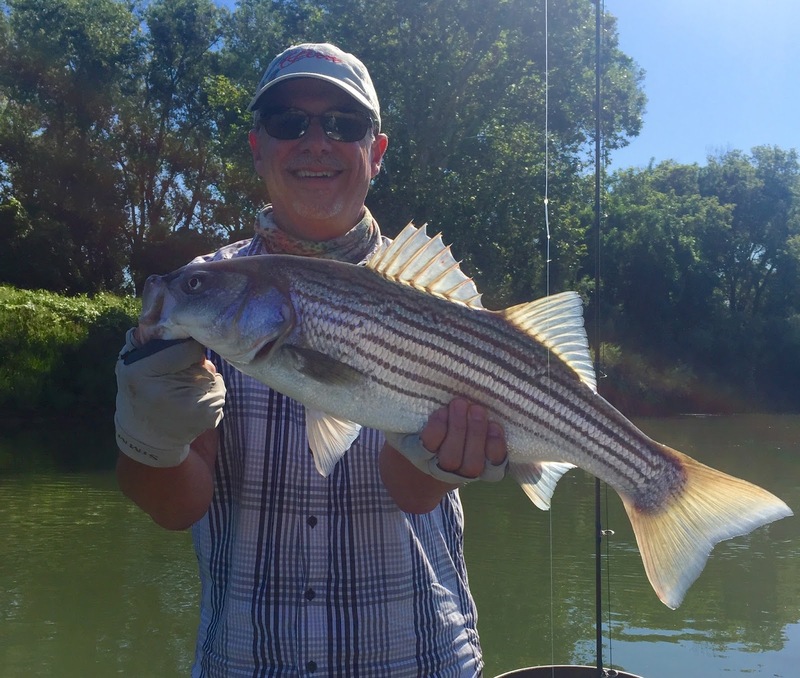 Good numbers of keeper size stripers and fish up to 10lbs with the big fish 20+lbs starting to show themselves. July -October is when the big guys move up daily into the shallows to eat and anglers have shots at them. Not everyday but most days we see, have shots at, and some times hook some of these guys. Flows are good and water temps are all where they should be so it is shaping up to be a great summer of striper fishing. Still fishing the heavy lines but the weeds are starting to come up and there a few spots we are pulling out the intermediate and type 3 lines. Vacation fishing...I took my family down to San diego to go to the San Diego Zoo, Lego Land, Beach, and site see. 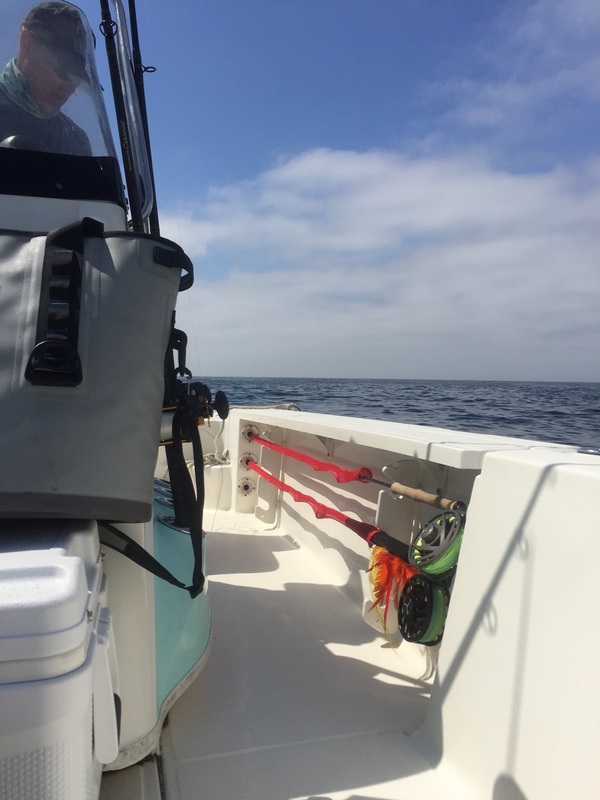 While I was down there I got to fish with my good friend Conway Bowman for Mako Sharks on the fly. By far one of the coolest visual fly fishing experiences I have ever had. seeing a 6' 125lb mako eat a popper at 50 feet is pretty Insane and then having that fish rip off line on a 14wt like a bonefish on steroids is pretty cool. Site fishing to these fish on floating lines, poppers, and big flies right under the surface is really cool experience if you are ever down in San Diego. Conway doesn't guide much anymore but Dave Tremble does and is a great guide down there. Music Reports - Been listening to a bunch of old stuff...really enjoying the re-release of the Rolling Stones Exile on Main St. that came out a while ago. Has some great unreleased songs on it and out takes as well as all the classics. Also been listening to Sturgill Simpson as I just bought tickets to see him in Redding, CA of all places. His newest album is a great listen and his older ones are different enough but the same enough to keep it all interesting. Also bought an album by a band named the Quiet Hollers that I heard on AudioTree Live which is really good. They are from Tennessee and at times sound like Band of Horses, Lucero, and kinda 80's indie band...Good listen. Great Video about Simms and making waders in AMERICA!!!! I am proud to be a Simms Ambassador and wear everything from Simms Waders to Underwear to belts to flip flops. Stuff lasts like nothing else and works like no bodies business. 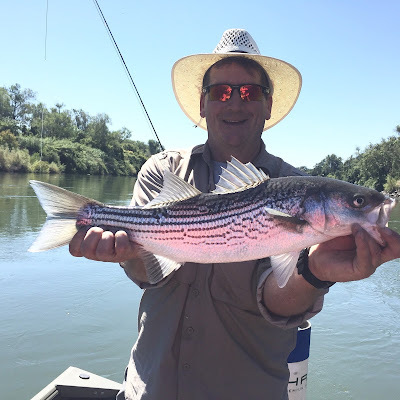 Lower Sac Striper fishing is picking up. There are good numbers of smaller fish around and we have been getting a fish or two around 10lbs each day. I think most of the bigger fish are still stuffed to the gils with Shad. 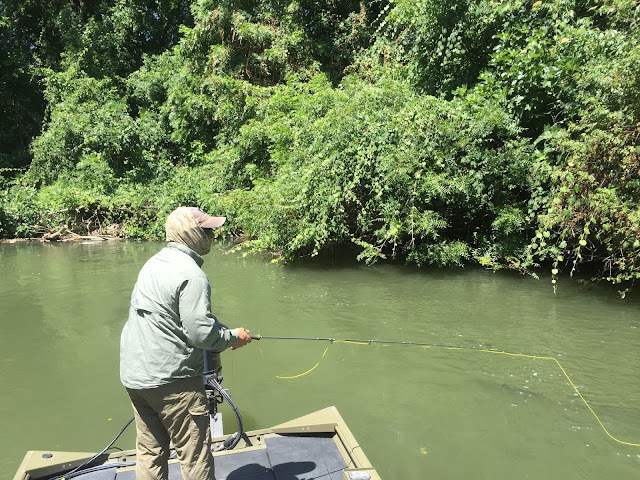 I saw a nice 15-25 pound fish floating down river the other day and pulled the boat over to look and he had 4 shad tails coming out of his mouth…bit off a bit more then he could chew. Flows are up around 6000cfs and water temps range between 61-67degrees on a given day and stretch of water. Weed growth is just getting going and really not part of the game yet. Fishing should continue to get better and better as the shad thin out and the weeds come up. Lower Sac Trout fishing is fair to good depending on the day and the weather. I have had some decent days down low from Barge to Bend but the bite can go from on to off pretty quick. Size of fish in the lower river has been above average as well which is nice. Fish have been eating caddis and smaller stoneflies the best for me. The flows are up around 7000cfs and it is nice to fish some spots that haven’t had water in them for a few years. The first float I did from Jellys to Bend was a bit of an eye opener as I had to remember how I use to fish certain spots as there was much more water then previous summers. River is pretty vacant down low and most days I have the floats to myself. Lower Yuba River dropped down to about 1800cfs but has come back up to 2300cfs. These are both good flows for floating the river but I have not been over to fish it. I am sure that the up and down is going to be the standard for June and July as run off ebbs and flows with the weather. This is one river that can be tough to fish if the flows bounce around to much. I don’t hear many reports and I don’t know any guides that are on the river so might be a good time go! Sports Report – So the Giants are in first place but the injury bug has hit them HARD! Pentz, Pagan, Cain, Buster (playing but not healthy), Romo…. all dinged up and lets be real the bull pen is NOT what it has been. While we are 3rd in the major league in winning one run games it seems like the Pen has given up a tone here lately, might be that I am just use to a lock down bull pen and if we have a lead into the 7th it is going to end with a “W”….Today is a big game if we can take 2/3 from the dodgers and split with Boston I am happy with this weeks games. Music – Been listening to a ton of good music. Bought the newest Northecote Album “Hope is made of Steel” and am really liking it. It is a bit polished compared to his previous albums, wish there was a bit more grit and grime on it so to say, but there are a few solid songs on it that will hold up no matter what. Heard a band by the name of Queit Hollers from Tennese and bought their latest album and am digesting that right now. I saw them on www.audiotreelive.tv and bought their newest album. If you have never checked audio tree live out I highly recommend it! Great way to discover new bands, get to know bands you may already know, and see some high quality live recordings.